If you missed it, SOE has been having their annual fan-fest, and with it have finally dropped the first details about the highly anticipated Planetside 2. If you're not familiar with it Planetside, was the first MMOFPS launched in 2003. Allowing truly "massive" game-play with all manor of tanks, aircraft and infantry combat, you the player took on the roll of a foot soldier in one of three empires; The Terran Republic, The New Conglomerate, or the Vanu Sovereignty. With features like squads, platoons, inventory systems, and outfits (clans), Planetside managed to combine the FPS and MMO genres in a seamless way. The biggest draw of course were those massive battles, with hundreds on players on each side able to actively participate on one continent (map). Now CEO John Smedley and SOE plan to out do themselves with the second installment in the series. One of the things they're trying to improve on from the first game is territory control. In Planetside 1, territory control revolved around large bases leaving much of the area around the map un-played. In Planetside 2 SOE is trying to correct this by making ever square inch of the map controllable. In the Q and A panel at fan-fair they talked about a hex system similar to what you see in Civilization 5. Each controllable territory could be any number of hexes large. Adjacent territory will also play a big part, as they will provide bonuses to capturing territory next to you own. One of the examples they provided in the panel was that, you could in fact capture territory deep inside your enemies lines, but it might take you 30 minutes. While that same enemy might only take 30 seconds to recapture the area due to adjacent territory. They talked about certain facilities that might further enhance your "influence" over other territories to the point you might not need to fight to captures new areas. One of the problems with the first game they are trying to address in Planetside 1 is the flow of battle. The original started with you outside the base fighting using air and tanks, then you combine arms with infantry and fight in the courtyard, finally ending with a purely infantry fight once you got inside the base. This lead to repetitive play as this pattern was repeated for every base. In the 2nd edition there going to have certain areas were it might be open planes perfect for tank battles, or very mountainesque areas more suited to air power. There will also be certain areas on the map that, once controlled will generate resources for that empire. From what we've been told resources can be use by the player to upgrade weapons, and vehicles. These resources might migrate with the territory system to keep the battles from becoming to stale and repetitive. In the future of the game they plan on not only adding more continents to Auraxis but more planets to fight over. A big change from the original is the new class system. 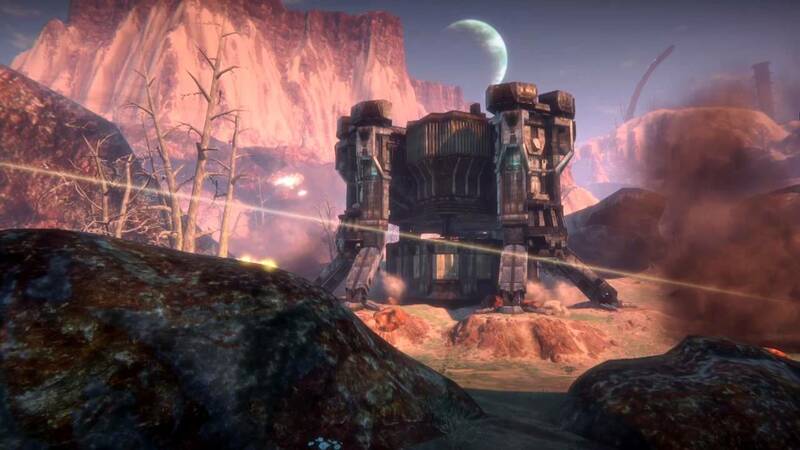 Planetside 2 will feature multiple classes each with their own unlock trees. Its been said that switching between classes will be seamless, allowing you to change to what is needed in a hurry. The unlock trees will give you access to new weapons and weapons mods as well as improving your specific role, and vehicles. They specifically mention the role of squad leaders and some of the different abilities they could unlock through progression. Certain abilities would buff your squad, and new to Planetside a form of "squad spawning". They didn't go into great detail about it but, said the squad spawning wouldn't be used indoors and mentioned "drop pods". Perhaps this will be a similar system to BF2142. Now all these unlocks will be handled through a twist on Planetside traditional certification system. In Planetside 2 you will train certification in much the same way you do in EVE. Each cert will require a certain amount of time to train, however playing the game speeds up the training rate. Meaning that a person who can only play a few hours a week will still be able to advance their character, but the person who can play all the time will still advance their character at an accelerated rate. Battle Rank is also making a return and will be used. What certification are available to train will be based on your Battle Rank, so someone with a higher BR will have more options then a lower lever character. In addition to your individual skill tree, there will be an Outfit (clan) skill tree as well. In the panel John, and the other devs talked about Outfits (clans) being able to use these skill trees to further enhance their players and actually have outfits specialize in roles, like an all Air Cav Outfit (clan) or a Armoured Outfit (clan). In game Voip was mentioned through the use of Vivox, but no details were given on what level voip would be available in the game. When asked whether Planetside 2 would also be produced on the PS3, Mr. Smedley smiled and deflected the question. Although from the way he was acting this seemed a possibility. Player count was also brought up, and the devs said in the thousands but, numbers would be subject to how well the game played. They emphasized that they want the game to look good on older systems and that frame-rate is key to the game, to quote "Speed before beauty". On game-pace the devs said they wanted to get away from the downtime you spent in PS1. With that in mind the original sanctuaries from the first game are gone, replaced by one uncapable base for each faction on every continent (map). This and what they referred to as higher lethality over the first game is one of the reason there were introducing "squad spawning". The panel was asked about hacking. The devs stated their #1 goal was to combat this and would be using a "very popular" third party anti hack system, but were not able to name it. Finally the dev panel talked about future development for PS2 and there 3 year plan, which they intend to show the player-base and have them offer suggestions on. All in all a very insightful panel on Planetside 2, and will hopefully satisfy you Planetside fans out there. If you're like me you are absolutely giddy in anticipation for what I hope will be the game of the Decade. If there was any negative about the panel was no mention of a beta date or release date, but hopefully the info will be along soon. For those who would like to view the panel for them selves here its is in two parts, Developer Round Table, and the Developer Q&A Session. Also for your enjoyment is the release trailer for PS2. I'm very excited for this game. One of my friends played the original Planetside a lot, and absolutely raved about it to me. I missed the first title, so I'm looking forward to PS2.Great write up! hehe the lines that he doesnt know about in the game are waypoints set by him or the squad leader. Oh I played this game and loved it. As the battles became concentrated at one base the the amount of people fighting grew. I thought it was alot of fun trying to acheive objective. Never played PS1, but really looking forward to this. Almost reminiscent of Mass Effect.